Barça have not lost a Champions League match at home since they went down 3-0 to Bayern Munich in the 2012/13 semi-finals. Three seasons and 15 matches have passed since then, and in that time they have strung together fourteen wins and just one draw. Not one team has managed to score more than one goal at the Camp Nou in any of those games. 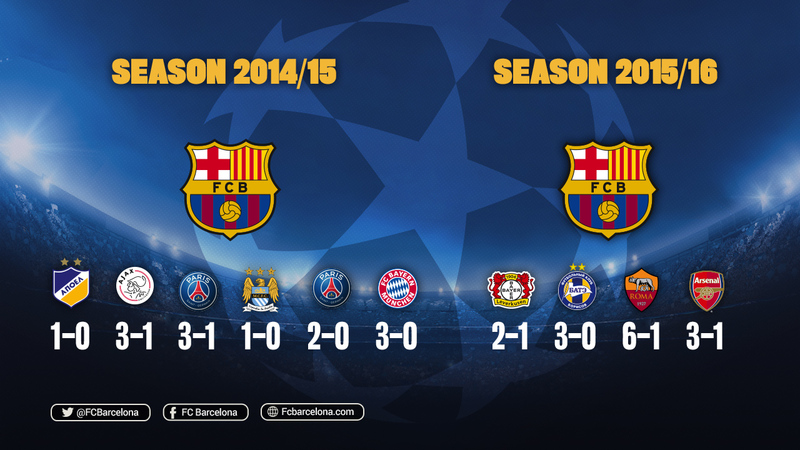 Barça just can’t stop breaking records these days! The 38 match unbeaten streak is already sending shockwaves around the world, and now the team has just completed an unprecedented 10 match winning streak in Champions League games at the Camp Nou. Those games have seen Barça score a massive 27 goals (2.7 a game) and concede just five. It all started in Luis Enrique’s first European fixture in the stadium, a 1-0 defeat of APOEL. Barça went on to win 3-1 in the other two games in the group, against Ajax and PSG. In the knockout phase, the Catalans saw off Man City (1-0), PSG (2-0) and Bayern Munich (3-0). It was quite some achievement to get through all three ties without conceding a single goal at home, and Barça of course went on to win the title in Berlin, part of the club’s historic second treble. The wins have kept coming this season. The group stage started with a 2-1 defeat of Bayer Leverkusen followed by wide-margin victories against BATE Borisov (3-0) and Roma (6-1). That last win confirmed Barcelona’s place in the last sixteen, and the 3-2 second leg defeat of Arsenal on Wednesday ensured a ninth consecutive qualification for the quarter finals. Ten straight home wins in Europe is the best run Barça have ever put together. They managed an impressive nine under Pep Guardiola from 2009 to 2011, having already done likewise in 1986 and 1992. The next challenge is to match the eleven wins achieved by Real Madrid in the 2012/13 and 2014/15 seasons, and after that the all-time Champions League record of twelve by Manchester United in 2006/07 and 2007/08..